The First African Methodist Episcopal (FAME) Church is today the oldest and one of the largest African American congregations in Los Angeles, California. It was founded in 1872 by Bridget (Biddy) Mason who arrived as a slave in Los Angeles with her owner in 1856. However, since California was a free state, Mason with the help of local black and white abolitionists, successfully sued in court to win her freedom. In 1872, Mason organized the first FAME meeting in her own home, which twelve other people attended. The congregation remained very small and their meetings were held alternatively in the members’ homes. 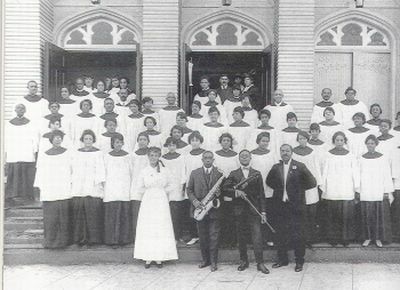 During the 1880s, as migration of both blacks and whites to Los Angeles increased, FAME Church became more popular, particularly among the middle class blacks. The first permanent church building was established in 1903 on Eighth and Tome in the African American business district. The gothic-style church became a community landmark. Trouble faced FAME Church in 1915, when the popular Reverend Napoleon P. Greggs was removed by an AME Bishop, outraging many church members. Several left the church to form the Independent Church of Christ (later People’s Independent Church) with Greggs as minister. This schism destabilized the church but through the leadership of senior minister, Reverend J. Logan Craw, FAME quickly gained strength again as well as its prominence in the black community. By the 1960s the area around the church became industrial and commercial, so relocation was sought. In 1969 the church moved to 2270 South Harvard Boulevard in Southwest Los Angeles where it remains today. The number of active members remained under 200 until the arrival of former Seattle, Washington pastor Reverend Cecil L. Murray in 1977. Under his dynamic leadership, which lasted until his retirement in 2004, FAME was transformed. The membership grew to 18,000 and a greater emphasis was put on social welfare. FAME Church had always been involved in the community, especially in regard to civil rights. During the late 1800s, FAME members became outraged by school segregation in Los Angeles. M. Horatius Martinez, a local attorney, went to court with the support of FAME Church members and won a legal decision that integrated local schools. In the 1960s, during the height of the Civil Rights Movement, the senior minister at FAME, Reverend H. Hartford Brookins, urged the members to become more involved. Through the support of FAME Church, Tom Bradley, a prominent church member, would become mayor of Los Angeles in 1973. FAME Church continues it work in social welfare. The church spends over $2 million annually to support over 40 community programs, including housing and food for the homeless, legal assistance, and youth programs. Darnell Hunt and Ana-Christina Ramón, eds., Black Los Angeles: American Dreams and Racial Realities (New York: New York Press, 2010); Douglas Flamming, Bound For Freedom: Black Los Angeles in the Jim Crow Era (Berkeley: University of California Press, 2005); George Barna and Henry R. Jackson Jr., High Impact African American Churches: Leadership Concepts from Today’s Most Effective Churches (Ventura: Regal Books, 1989); Brent Alan Wood, First African Methodist Episcopal Church and Its Social Intervention in South Central Los Angeles (Los Angeles: University of Southern California Press, 1997). University of Southern California Press, 1997).